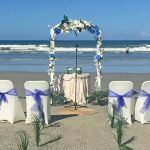 The “Maya” is an extremely popular base package for a ceremony with a four post bamboo arch and some elegant decorative tulle wraps, as well as greenery. The Officiant is included! 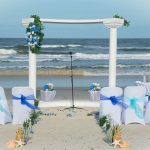 Sand ceremony (optional) can be performed inside the arch as shown.